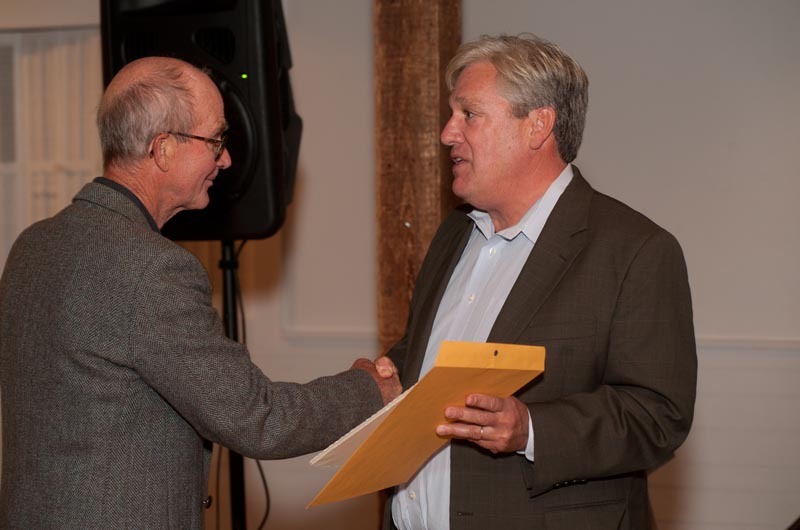 Edward Miller (right) presents Rez Williams with Creative Living award. 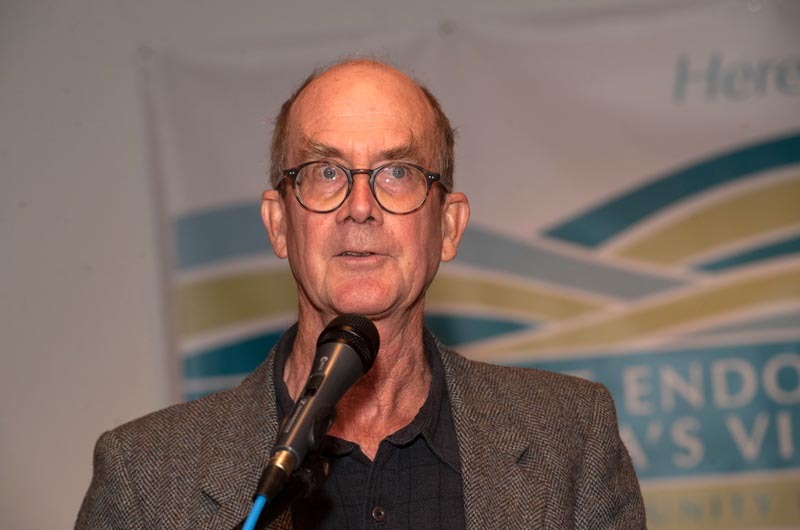 Mr. Williams was honored Monday with the Creative Living Award from the Permanent Endowment of Martha’s Vineyard, an annual award given to members of the community who love the Vineyard and have made significant contributions to quality of life on the Island. The award is sponsored by the Ruth J. Bogan-Ruth Redding Memorial Fund and has been given to Islanders since 1983. The West Tisbury painter was honored not only for his brightly colored depictions of fishing boats and the waterfront that “startle and attract” but his commitment to conservation on the Island. “We all know and love Rez for his art, but many of us may not be aware of the public service to the community Rez has rendered over the years,” said Brendan O’Neill, the executive director of the Vineyard Conservation Society. Mr. Williams was one of the longest serving board members of the Vineyard Conservation Society and also served as president of the Sheriff’s Meadow Foundation. Mr. O’Neill recalled Mr. Williams’s “calm courage” during fights to protect open space on the Vineyard. “Through all these challenges Rez was really an anchor in the VCS boardroom,” Mr. O’Neill said, adding that he helped launch the Island’s first Earth Day beach clean-up and advocated prescribed burns to maintain habitats. “Both through his art and through his actions, Rez Williams has accomplished what this award seeks to recognize — helping the present inhabitants of Martha’s Vineyard realize that value of their treasure. Thank you, Rez,” Mr. O’Neill said. One of his paintings of a boat is titled Shot. 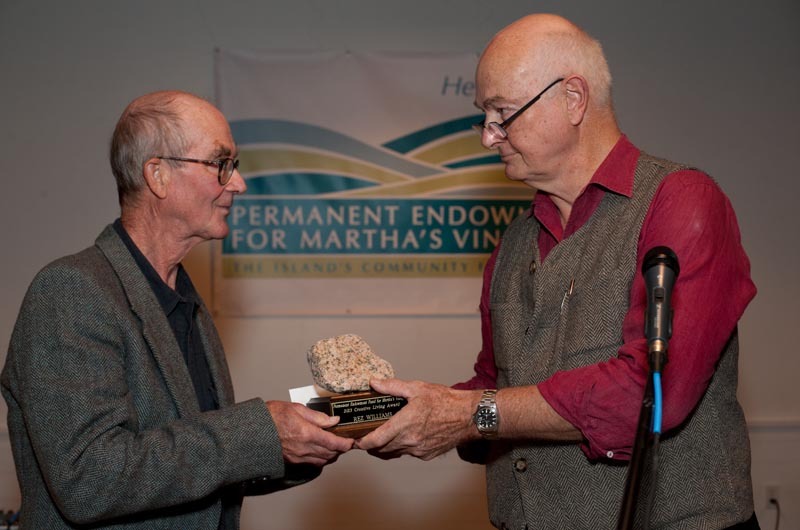 The trophy itself features a Vineyard rock, a representation of the Permanent Endowment’s motto “Here for good.” Mr. Williams also received a check for $1,000. When presenting the award to Mr. Williams, endowment board member Edward Miller noted the artist’s role in creating a collection of art at the hospital, donating two major works and convincing others to do the same. Mr. Williams then drew the winning ticket for a lottery, with the winner receiving $1,000 to donate to the Island nonprofit of his or her choice. The winner was Anita Hotchkiss, who told the Gazette she hoped to donate the money to the Marine and Paleobiological Research Institute and Women Empowered. Earlier in the night, Mr. Karasik quoted the late Metropolitan Museum of Art director Thomas Hoving, a Vineyard visitor. When asked which living American artists one should collect, Mr. Hoving’s short list included Mr. Williams. Mr. Karasik quoted Mr. Hoving from Cigar Aficionado magazine.